We have a lot to celebrate. 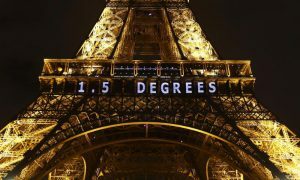 The COP21 Paris Agreement beat the odds: an accord was struck among 196 countries to cap global warming at the 1.5°C threshold. The world cheers the success and we join along convinced that the agreement will serve as an impetus for change. Indeed, the world is transitioning to a new economy in which our governments and businesses will build more resilient operating models. The game-changer at the Paris Climate Conference was the influence that business had on the conversation. Companies publicly committed to new and challenging targets, particularly the setting of greenhouse gas emission reduction in line with climate science or science-based targets. This welcome rise in science and measurement will help companies make fact-based decisions. And even though the agreement was on climate, I was happy to speak to many companies looking beyond carbon to other environmental issues such as water, biodiversity and deforestation. But soon the 2015 party will end, other headlines will grace our newsfeeds, and our valiant sustainability champions will be left to lead the 2016 acceleration. Still looking for the sustainability business case? Stop. It’s right in front of you. COP21 provides the missing, long-term framework that businesses needed to accelerate the transition. Traditional, incremental change is not going to cut it. Sustainable companies are not being “managed”. Leadership, vision and purpose drive the most resilient, sustainable companies. Engage in a disruptive model: leverage your eco-system of partners and peers. Wanted: Board-level CSO. Yes! This signals to your stakeholders that being resilient is a priority for your company in this changing economy. Who’s accelerating? Who’s putting on the brakes? You might want to get those people in the same room. If you’re the one putting on the brakes, ask yourself: “Why?” It usually comes down to a lack of true understanding. To the champions: try to engage, educate and communicate in the other’s business language. Is there a commitment gap between your organization and those of our trade association? This was a hot topic during the COP21 side discussions. Environmental advocacy can, in fact, go opposite the vocal commitments. Check with your industry group. Sustainability methodology has stabilized. The good news is that solid methodologies and tools have been developed to tackle today’s environmental challenges. Expand to Scope 3. The majority of your impacts come from beyond your four walls. Check out our study on Swiss Scope 3 measurement and reporting or our Scope 3 webinar series (1 Get started & 2 Start Leading) to learn why it’s important for your business. It’s about Generation S. Despite the attractiveness of Millennials, it’s really about the leadership of “Generation Sustainability”: people within your company, those you sell to and buy from. Stakeholders want to know that you are doing business in a responsible, post-COP21 way. The transition is both exciting and challenging! I’m privileged to lead a passionate group of sustainability champions and environmental impact experts that get to work with innovative organizations every day. At Quantis, we help companies transition to the new economy by sharing knowledge and expertise, by co-creating strategies, and by building compelling, fact-based sustainability stories. So before we accelerate in 2016, let’s celebrate a little longer. Here’s to you: my team, my partners, my peers and to all the champions!